Hi there! 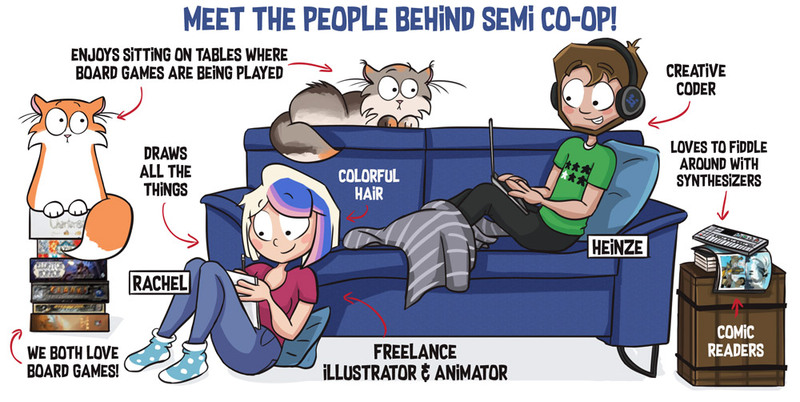 We’re Rachel Kremer and Heinze Havinga, two board game enthusiasts from The Netherlands and like to share our fascination with the world through silly and funny comics. This comic is about us, our cats and our experiences in the wonderful world of tabletop games. It might be exaggerated here and there… eh, we’ll just call it semi-biographical! Rachel is also a freelance illustrator and animator, if you are interested in her work besides Semi Co-op, you can check out her portfolio at rachelkremer.nl. For publishers, game designers or event organizers we offer an option to commission a sponsored comic, so we can make a comic about your game or other tabletop-related thing! How does this work? You can either propose your own idea for the comic or let that part up to us. We can think up a comic based on the rulebook or on the actual game if you send us a copy. Together we will make sure it will be an awesome comic you can share with your audience! If you’re interested you can mail us at info@semicoop.com for pricing and more details! You can always send us an email at info@semicoop.com or find and contact us @semicoop on Facebook, Twitter, Instagram or YouTube.